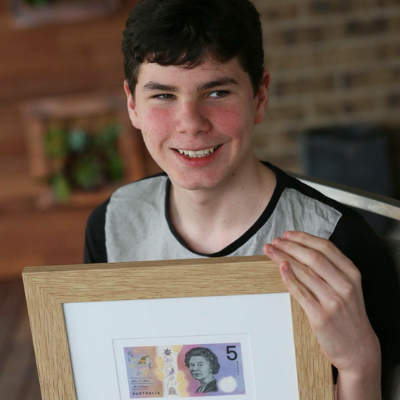 Blind from birth, Connor McLeod campaigned the Reserve Bank of Australia to print tactile banknotes. Connor’s idea arose after he was given money for Christmas, but could not tell the amount in his hand. The teenager – who has represented his school at state level athletics, rides a push bike, abseils, rock climbs, swims, and plays the drums and keyboard – started a petition. Garnering the support of 57,000 people, as well as the Human Rights Commission and Vision Australia, Connor lobbied the then-treasurer Joe Hockey and filled a human rights complaint against the government. He refused to take no for an answer, even going to Canberra with his mum to deliver his petition to the government. It worked, and in September 2016 the first tactile $5 note was launched. With a steely resolve, the power of an online army behind him, and a willingness to share his story to help others, Connor has improved the day-to-day lives of 357,000 Australians living with vision impairments.